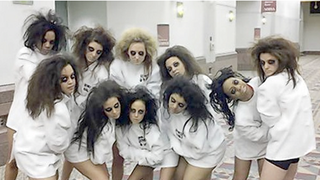 Today in "who approved this": A college dance team competed in straitjackets, wild hair and dark eye makeup — prompting, not shockingly, criticism from mental health advocates. For those who've been working against the stereotypes, cliches and societal insensitivity associated with mental illness, it's easy to see how the Robert Morris University competitive dance team's routine would be...problematic. Indeed, it's harder to imagine who thought it was just fine. Explains Suzanne Andriukaitis of the National Alliance on Mental Illness of Greater Chicago, it's not just a question of sensitivity; things like this contribute to a general sense of shame that those with mental illness often already feel. "There's a general stigma of blaming the individual for the illness, and that makes people afraid to go and get treatment, afraid of being labeled 'one of those people' with the straitjacket and the frizzy hair." Robert Morris President Michael Viollt said the costumes were inappropriate and will not be worn again. Outfits for the dance team, which until now have not been approved by the school, will go through the same committee that approves the uniforms of sports teams, he said.He said mental health awareness at Robert Morris is conducted mostly in classes dealing with the subject but added that the university will consider any changes that might help increase sensitivity toward people with the disorders. "We will look into the whole gamut of it," he said. He said when he saw the routine, the dancers represented zombies; the straitjackets were a later addition. That said, it's really hard to argue with the compelling defense of one commenter on the article who observes, "Are magicians wrong for putting on the jackets and attempting to free themselves in a short amount of time.. Just like I said before it is art.. leave it alone."